This scene was all over my flower beds. It is so exciting. Mom's wheat grass is going to pop today. 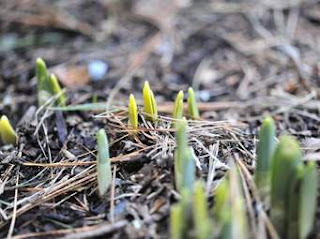 I could see the little shoots just barely peeking out of the soil. I love Spring. New life, new hope, new sore muscles. Okay the last not so much. But Spring is coming I can feel it, I can smell it when I walk outside. Mom has a doctors appointment this afternoon, so I will have to get her showered and ready, always a big task. She will be grumpy and awful. Things were very difficult yesterday. I thought the quilt would make her happy, but I did it all wrong and she kept questioning me about it and getting angry with me. I told her I had a very bad teacher. (she did not get it) Sarcasm is always my second go to after trying to reason with her. Later in the evening she seemed to like the quilt, so we will see how she feels when it is finished. I plan to try and do the binding today. I will take a picture. I just hope and pray mom is in a better place today. (Meaning a better mood) I cut out a really cute reversible jacket for her last night. After I get my quota done in the shop I am going to whip it together. I think she is excited about that. Who knows every day is a new adventure with her. My large container of copper polish came yesterday and it was smashed and spread all over the inside of a box. Hub's and I found another small bucket and scraped out the box. I did not think I could return it as it was a leaky mess and full of who knows what. So I reported to Amazon and said we would keep what was left and they returned my money. So a win, win. We used all the left over in the box by wiping it on a rag and polishing about 4 items. Amazon rocks. All of my prom dresses are out and I am hoping to tackle at least one wedding dress today after I get a a few things done around the house and all the other smaller things out of the shop. Yeah like this is going to happen. But a girl can dream can't she? Never mind I just got a coat in for a funeral that has to be out today and another prom dress. Plans are shot. Some days are like that. Did the box get smashed? That is a nightmare. I think your mother wants to be the authority and best at everything is why she criticizes some of your efforts. A quilt was the only thing my mother told me I did wrong. I started it when I was about eight, and she harped on it for years. When, I was 22, I threw it in the trash because there were so many negative memories associated with it. It was a crazy quilt like one I had seen. She wanted me to make square pieces...ugh. She never said one bit of criticism for anything I ever sewed, crocheted, or cooked. So, I cannot imagine how her constant criticism of things you do must affect you. Of course, she is elderly. My mother was not. Sorry for that rant, but quilt and mother criticism brought it all back. Get a bit of rest for yourself. Oh, what is wheat grass for and where is it planted? Every year we plant wheat grass and hide little miniature East figure in it. I agree some days are like that.....was planning on going out to lunch with Hubs and then hitting Ollie's(Good Stuff Cheap! )as I have a 10% coupon. Then I took Chester out to pee, slipped on ice and landed on my side. Now I've got a banged up knee, a bloody elbow and a sore as hell clavicle. ugh. Nothing but the recliner and pain killers for me today. I hope mom is in a better place today so you can be in a better place. I am so sorry. Did you rate your fall like was it an 8 or a 9.5. Post pictures of your bruises. Am I making you feel better? Hope your mom is doing well today! You certainly have your hands full. Yay for spring!!! I cut into a sample prom dress for Meri today and already have some adjustments to make when she tried it on just now. Too much cleavage and too much back. and this coming just from HER! :) Will be making another sample today.